Maui Nui Golf Club is a new favorite among golfers, as it has undergone some great renovations, including widening of fairways and new designs on several odd holes. Affordable and conveniently located in the heart of Kihei, it offers fantastic ocean and mountain views of both Haleakala and the West Maui Mountains. Trade winds add to the challenge at this course, perfect for beginners and avid golfers. 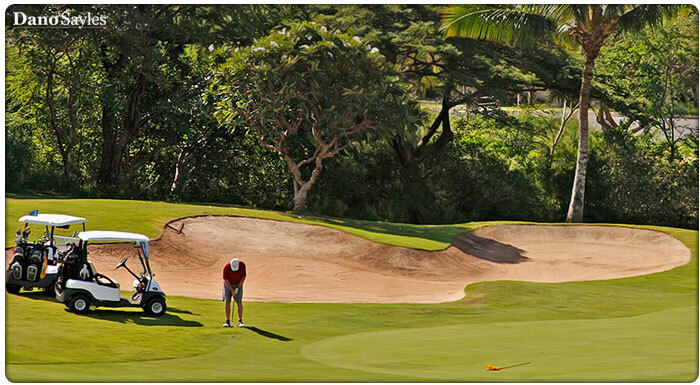 Reserve your game and cart by calling (808) 874-0777. The original course was designed by Robert Trent Jones Jr., and was ranked in the “Top 10 Hawaiian Golf Courses” by Golf Digest. The 18-hole course encompassed 1,800 acres along Maui’s rugged lava-ridden southern coast. In addition to providing a challenging play, the panoramic views, gnarly kiawe forests, and original ancient Hawaiian rock walls spread throughout, made for a unique experience. Guests of the Makena Beach & Golf Resort receive complimentary shuttle services to the adjacent Wailea Golf Courses. The Makena Golf Courses are located in South Maui, boasting 1,800 acres of golf perfection. Makena has two 18-hole courses designed by Robert Trent Jones, Jr. The South Course is a par 72 and 6,739 yards of rolling fairways with incredible ocean and Haleakala views. This course has 2 oceanfront holes as well as one of Hawaii's top driving holes, the Tenth Hole. With exception of views of the neighboring islands and breaching humpback whales, this peaceful course leaves you with very little distraction. The North Course is a bit newer, opened in 1993. Built into the natural surroundings of Makena's most beautiful landscape, the North Course offers the same unobstructed views as does the South. With fairways built to slope into itself, you'll have less lost balls, and more playing time. The cart paths are all hidden from view, and the original Hawaiian rock walls have been left untouched. These two considerations when building the North Course have made it seem more like a natural park than a structured course. Two of the holes are high above the ocean with incredible views. For rates, contact the Makena Resort. They offer regular, twilight, kama'aina, and resort discounted rates. Some of these course's largest attributes are it's pure greens, consistently excellent weather, and well managed tee times. Book your reservations by calling (808) 891-4000. Wailea Gold Course has been honored numerous times for its 1,078 yard course, designed by Robert Trent Jones; and has been dubbed a “thinking player’s course,” as it demands a strategic and conditioned golfer. The course has also been honored for its preservation efforts of the centuries-old Hawaiian structural lava rock walls. It is the more challenging of the three Wailea courses and was home to The Champions Skins Game from 2001 to 2007. With carpet-like fairways, ocean views and stunning natural Hawaiian foliage, this course has been called “Maui eye candy” by some. The course has also been dubbed as one of the “most friendly for ladies” by Golf Digest and was granted a “Top Fairways Award” by Golf for Women Magazine. Architect Robert Trent Jones II created this 6,825 yard course to be fun for all skill levels. The clubhouse offers Gannon’s Restaurant by the famed Maui chef, Bev Gannon. Situated on the leeward side of Mt. Haleakala, this classic golf course offers some of the best golf weather on the planet. The slightly higher elevation on some holes offer undeniably beautiful views of surrounding islands of Kaho’olawe, Lanai, Molokai, and the snorkel spot Molokini. It is the oldest of Wailea Golf Club's trio of courses, and is actually the very first thing ever built in Wailea Resort. 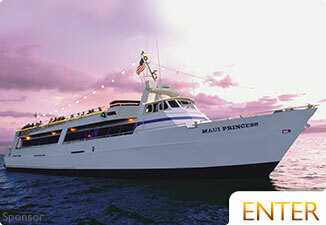 The “Grand Lady of Wailea” has been a favorite of Maui visitors for years. Mulligans on the Blue is a lively restaurant and bar located alongside the course. This is a favorite for West Maui golfers and it is one of only two courses in Hawaii designed by Robert Trent Jones, Sr. The course stretches 6,700 yards and is typical of a Jones course in that the it challenges players’ club selection and putting skills. Often called the ‘Tournament Course’, the Royal once hosted the LPGA events and the original Seniors Tour. Arnold Palmer once called the 18th hole one of the best and most challenging finishing holes he had ever played. Kaanapali Kai is a relatively short, par-70 course, that plays only 6,388 yards. It is considered much easier than it’s West Maui counterpart, the Kaanapali Royal Golf Course. And, some golfers use it as a warm up course to adjust to Maui trade winds. Originally designed in 1976 by Jack Snyder, it was later re-designed by Robin Nelson to allow for more expansive views and interesting shots. Some of these features include natural gulches, canals, Norfolk Pines, gorgeous plumeria and lava rock boundaries. The older of the two Kapalua courses, this impressive spread offers everything that typifies a Hawaii Golf Course. There are two gorgeous seaside holes. One of which, No. 5, was created by lava pumping into the sea creating what appears to be ‘arms embracing the sea’, which in Hawaiian translates to Kapalua. The tee is positioned on one side of Oneloa Bay, and using the trade winds, golfers launch the ball across the glistening ocean to the awaiting green. Arnold Palmer and Francis Duane did a superb job with this layout, bringing golfers back again and again. The Plantation Course at Kapalua is spread out across a former pineapple plantation and is spectacular in vistas and play. Ben Crenshaw and Bill Coore designed this course, and created arguably the most challenging on Maui. It is home to the PGA Tour’s Hyundai Tournament of Champions each January. (formerly the Mercedes Championship) Previous competitors and fans of the course include Tiger Woods, Ernie Els, Vijay Singh, Jim Furyk, Steve Stricker, and more. The well-known Plantation Restaurant is located at the club house. 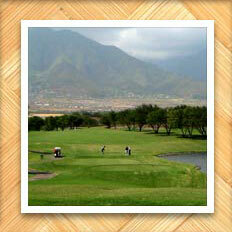 This complex golf course designed by Arnold Palmer is set on the West Maui foothills in Upper West Maui. Kapalua's Village Course is par 70 with great views of the ocean, Molokai Island, and the bordering pineapple fields. With huge pines lining the course, you'll be playing a diverse landscape that is far from an ordinary Hawaiian layout. This is one of the most beautiful of the courses in Maui. Nestled in the foothills of the West Maui Mountains, this centrally located golf course was designed by Robin Nelson and Rodney Wright. It is very similar to its next door neighbor, the King Kamehameha Golf Club course. Upgrades include TifEagle greens, white sand bunkers, and golf carts equipped with GPS. The course hosts numerous local tournaments each year, and is a popular choice for both visitors and locals. Be advised, the par 4s are designed to make you work! Named in honor of one of Hawaii’s greatest kings, King Kamehameha Golf Club is Maui’s only private 18-hole golf course. But, visitors should take advantage of their “Member for a Day” option to enjoy this course. Ted Robinson Sr designed the course, which was later redone by his son 14 years later. It can be challenging, and average golfers are advised to play the white tees. The club’s claim to fame, besides sweeping bi-coastal views, is their 74,000 sq. ft. clubhouse that was designed by Frank Lloyd Wright. The Dunes at Maui Lani Golf Course is designed much like the courses in the British Isles or Scotland, as its holes take full advantage of Maui’s natural topography with rolling sand dune terrain. Located in the gusty central valley of Maui, near the main business district, some of the course is exposed to mischievous 15-25 mph trade winds, which make for a playful and interesting day on the green. Cafe O Lei at the Dunes is the current onsite restaurant, and is a huge favorite among local Maui residents. 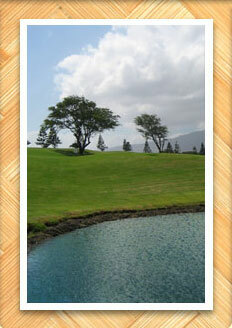 Waiehu Golf Course is probably the most affordable of all of Maui’s courses and is great for riding or walking. The famous Waihe’e Reef and the gorgeous white sand beach of Waiehu Beach Park are all visible from the course, and 3 holes play oceanside. Players meander through a series of bluffs on the back nine which makes for a nice finish. The Pukalani Country Club has the unique distinction of being Maui’s only course located “Upcountry”. This charming course offers cooler temperatures, unique views, and a more local experience as it is set outside of the classic tourist areas. The course is positioned at 1,100 feet above sea level, on the side of 10,000 ft Mt. Haleakala (house of the sun), the world largest dormant volcano. The course also offers a unique double green option on the par-3 at hole No. 3. Here golfers are required to launch the ball over a large gulch. Playing this course it worth the drive! CLOSED: Under renovation until late 2014. The Experience is the second of two incredible courses on the 140 square foot mile island of Lanai. The course is set inland and is praised for its mountain views and wooded slopes; and due to its slight elevation, guests are treated to views of Kalohi Channel and the nearby island of Molokai. Golfers thrill at the unique water features and hazards, such as streams and numerous cascading waterfalls. The end of the course brings golfers to the signature hole No. 17 that plays from a 250 ft elevated tee to a nearby fairway surrounded by a lake and foliage to one side. The course creates a stark difference from its counterpart, The Challenge at Manele. One of only two impeccable courses on the quaint and luxurious island of Lanai, The Challenge at Manele is a bit more forgiving than its counterpart, The Experience at Koele. The Challenge is situated on the cliffs overlooking Hulopo’e Bay and has three holes at the cliffs edge, forcing players to use the crashing waves below as a natural hazard. Trade winds can pick up, but multiple tee boxes ensure a fun play for all. Jack Nicklaus unveiled his creation on Christmas Day, and during such winter months, whales can be seen frolicking in the waters below. Since 1977, Kaluakoi Golf Course has attracted golfers to the island of Molokai. Built by Ted Robinson, this par 72 course has all around ocean views and you rarely have to wait for anyone. This uncrowded course is set at a low price and sits on 160 acres of perfectly manicured Bermuda grass.